Daily deal site 1SaleADay is currently hosting a flash sale on a number of smartphones, three of which are Samsung’s latest flagship devices including the Galaxy S4. But if the newest from Samsung isn’t on your radar, they also have the Galaxy S3 and Galaxy Note 2 at decent prices. All of the phones being sold are unlocked and likely compatible with AT&T and T-Mobile, though the supported frequencies are surprisingly unlisted. 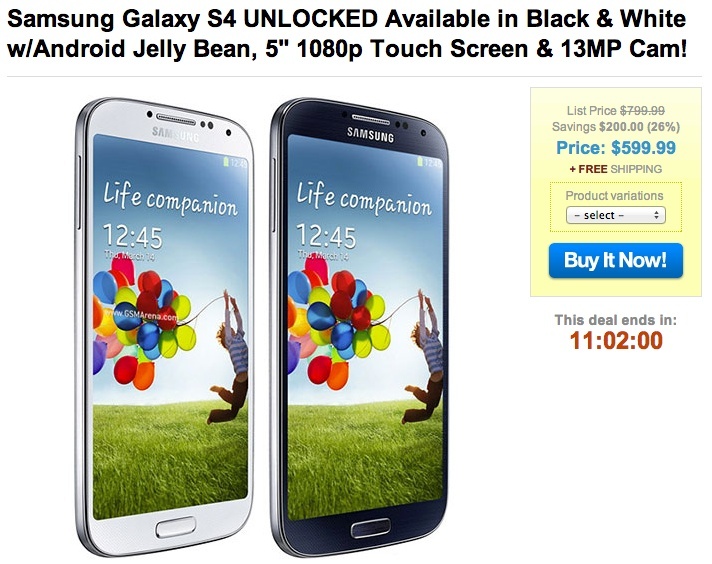 The Galaxy S4 with 16GB of storage can be had for $599, which is at least $50 cheaper than you will find at most unlocked phone resellers. The Galaxy Note 2 is available for $499, while the Galaxy S3 drops in at $409. Again, all phones are unlocked, come in retail packaging, and are brand new. In order to access the flash sale, you will have to register an account with 1SaleAday – apologies.